Whew. What a week! I switched projects part way through. I know what you're thinking, "Brian, you just put on project on the back burner, don't give up." Don't worry, I'm not giving up on the bike, far from it, I just couldn't get to the hack space to work on the bike and I didn't want to waste time doing some minor bike construction in my apartment so I did something productive on another project. But I'll get to that. Attaching the bike frames together was supposed to be relatively easy, I was expecting the bike seat to be a huge challenge but that went pretty well. I built a seat with only one lost day in a time-wager. Attaching the frames has cost me a lot of time and materials. 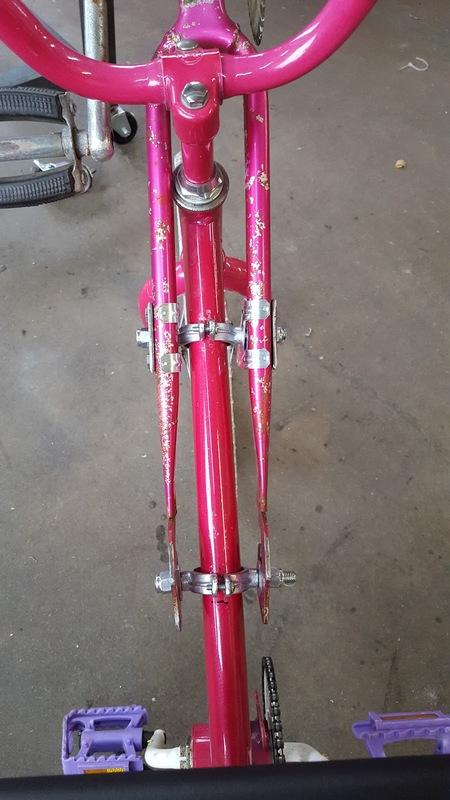 But, it's important they attach firmly because any wobbling between the frames could lead to an accident while riding. Keep in mind this bike frame was built on a girls' bike frame so it wasn't really intended for someone my weight and anything I can do to add to my safety is probably worth the effort. The key to the frame was to stop trying to cobble hardware store parts together. I still did some of that and the inspiration for the final design was based on parts I had seen in the hardware store while shopping earlier. So it wasn't a completely lost time-wager. 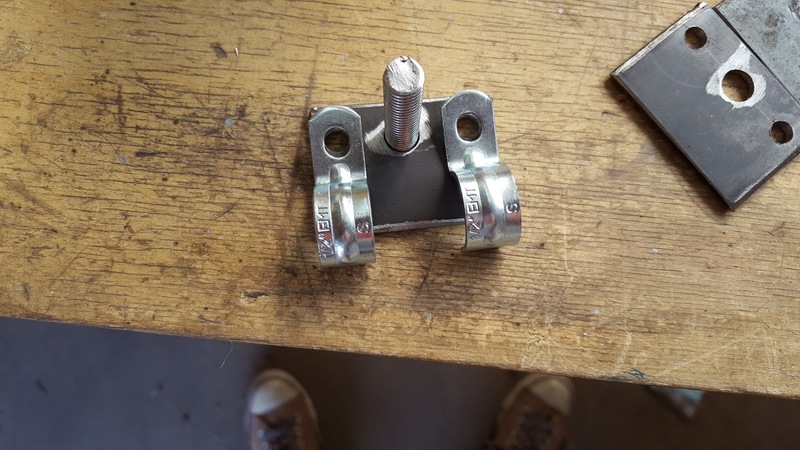 The final bracket was a couple strips of steel bar I salvaged from the hack space recycling bin. This is commonly available at home improvement stores as steel bars or angle steel. Rectangles were cut out and drilled with three holes. 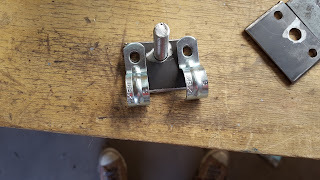 Two of the holes were for holding brackets, just single-hole pipe clamps, and a larger central hole for a threaded rod to connect with the brackets on the bike frame. It worked well and by adjusting the hole positions it is possible to change the angle of the upper bike frame. Most importantly, these feel sturdy. 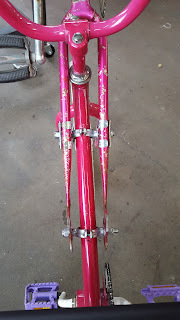 The brackets were first attached so the pipe straps hung down, with their mounting hole on top, but this angled the upper bike frame too close to the wheel so the brackets were flipped which raised the upper bike frame and cleared the front wheel. Making this adjustment also made it clear to me that by making new brackets with the holes in different positions it would be easy to put the upper frame wherever it needs to be. 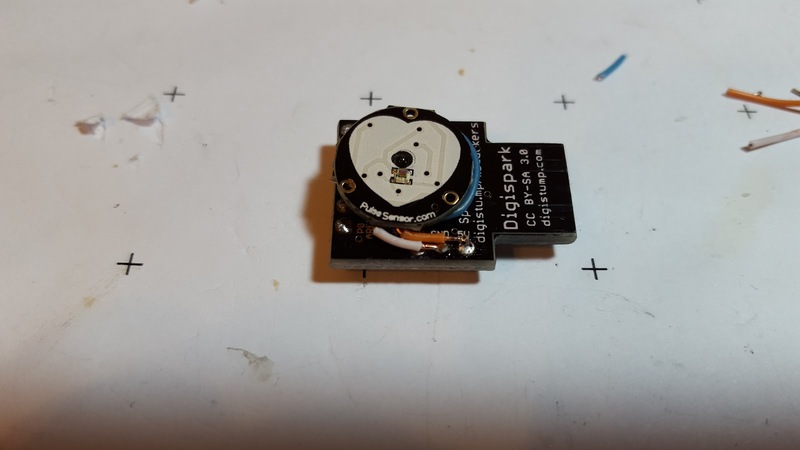 It's not easy to get to the hack space every night and there's only so much I can do in my apartment but sitting idle isn't my idea of a good evening so I got to work on a heart rate sensor. This is hardly a new idea but the feedback is novel. 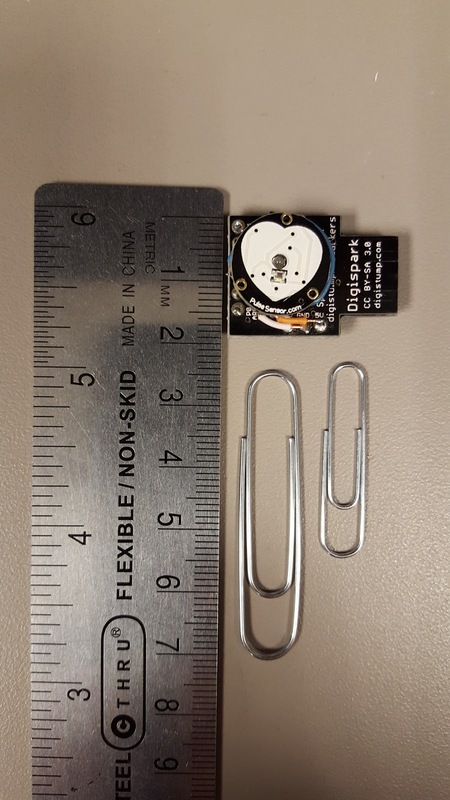 Instead of displaying a person's heart rate on a display this device will translate heart beats into electromagnetic pulses which can be sensed by a cyborg with a finger magnet. Since I'm at it, I may make a version which uses a vibrating motor instead. That way everyone can build a version which suits them. 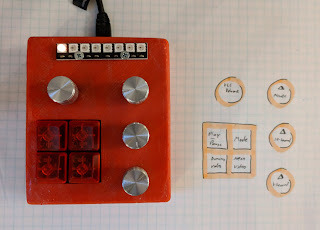 The first thing was to build everything on an Arduino UNO. 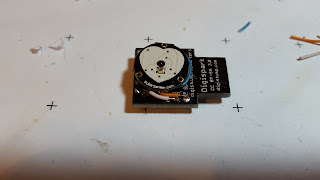 This was done for starters because the UNO has headers which makes it easy to attach components like LEDs or the heart rate sensor which came with DuPont wires. Code was available on the manufacturer's website but a few changes had to be made before the code was function properly. Once the operation was proven on a robust board, the UNO, the heart rate sensor was soldered to an small and inexpensive Arduino-compatible board with an ATtiny85 controller. This board is full-featured like the UNO but it is compact and has enough power and I/O (inputs and outputs) for this project. Stock code for the ATtiny85 needed some changes. 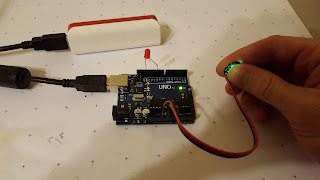 But, the people who provided the code ALSO included direction for running it on an Arduino with a single timer, like the ATtiny85. The more robust Arduino UNO has two timers and since it is a very common chip family the code was written for it. Timers were not the only thing removed from the code, the serial communication code was also removed. With working code it was easy to experiment with power supplies. The board had a built-in USB plug so it was possible to simply plug it into a power pack and test my heart rate by flashing the on-board LED and confirming it with my own reading taken from my neck. It took about eight seconds to establish a reliable reading. 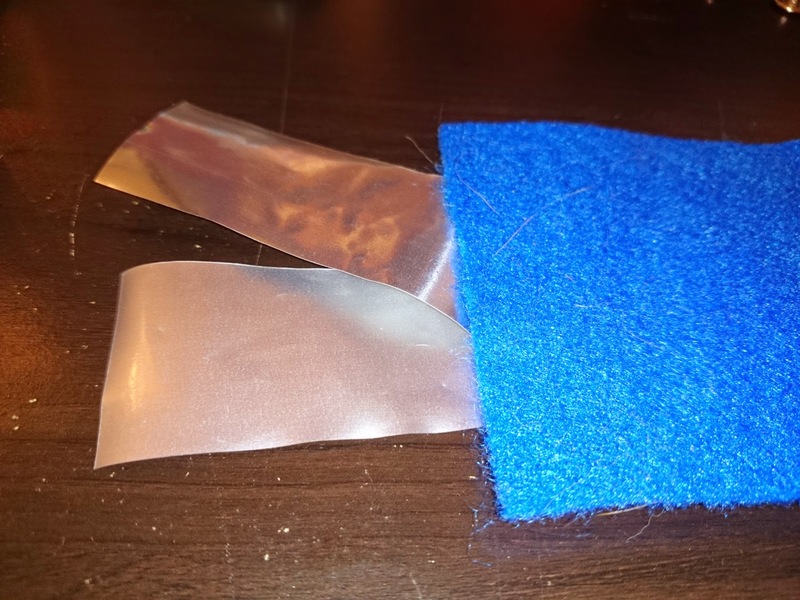 Since the output of this device will not be a light, but rather an electromagnet, some coils were wrapped to act as electromagnets. Four designs were wrapped. The first was a simple design with three loops. The second design was a tightly wrapped coil. The third design was a massive coil large enough to go over the implanted finger. 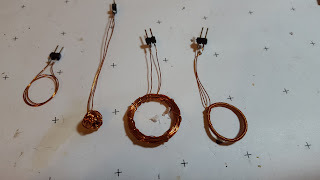 The last design was a finger-sized coil but mostly focused on the coil of wire wrapped perpendicularly to the large loop. Shown in the picture the descriptions follow the same order. Each coil was soldered to a pair of header pins.